Essential oils are great for massage, to diffuse and add to your bath. Nature Sunshine Products don’t recommend oils for internal use. Combining the oils with great health supplements, exercise and healthy diet can result in the results you are looking for to rid extra pounds. Peppermint oil soothes an upset stomach and helps to improve your digestive health. It also helps you feel full, stop cravings and give you more energy! Grapefruit oil is the best oil out there to suppress appetite, increase energy, prevent water retention and help the appearance of cellulite, prevent bloating and dissolve fat. Like the other oils Lemon essential oil helps increase energy, suppress appetite and improve digestion. It also helps the body rid toxins which that are stored in fat cells. Inhale some Lemon oil before a meal to suppress your appetite. Another great oil to suppress your appetite and boost your metabolism. Cinnamon oil also helps the body break down sugars for energy, instead of storing them as fat. Cinnamon stimulates circulation and has shown to improve IBS (irritable bowel syndrome). Bergamot oil is good for emotional eating. People eat more when they are stressed out and Bergamot will help when you inhale the scent before you eat, to help you relax and lift your spirit. This will help you to avoid over-eating when you are not truly hungry. INSPIRE Uplifting Essential Oil is a great oil to use to uplift your mood and help with weight loss. The ingredients includes Grapefruit, Peppermint, Cinnamon plus more citrus blends. Combining the essential oils for weight loss and to improve cellulite is a great addition to a weight loss program. In addition to the EOs supplements like Nature Sunshine’s Nature’s Cortisol Formula helps with belly fat. Cortisol is a hormone produced in the adrenal glands to in response to stress. This herbal formula help maintain blood glucose levels already in normal range. 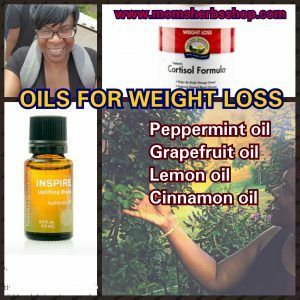 SHOP AT MOMSHERBSSHOP.COM FOR ALL YOUR ESSENTIAL OIL AND SUPPLEMENTS.